As Banff wedding planners we have the opportunity to visit many different venues and wedding spaces throughout the Bow Valley (Canmore, Banff, Lake Louise, Kananaskis). We are incredibly lucky because there are so many amazing locations to hold a wedding throughout all of these areas and today we want to focus specifically on the beautiful town of Canmore. Canmore is one of the most beautiful places in Canada and is located just outside of Banff National Park. The town is nestled along the Bow River and flanked on both sides by towering mountain peaks. There are so many incredible locations in Canmore for adventure, great food, shopping and of course weddings. Today we are going to share with you three of our favourite Canmore wedding ceremony locations. 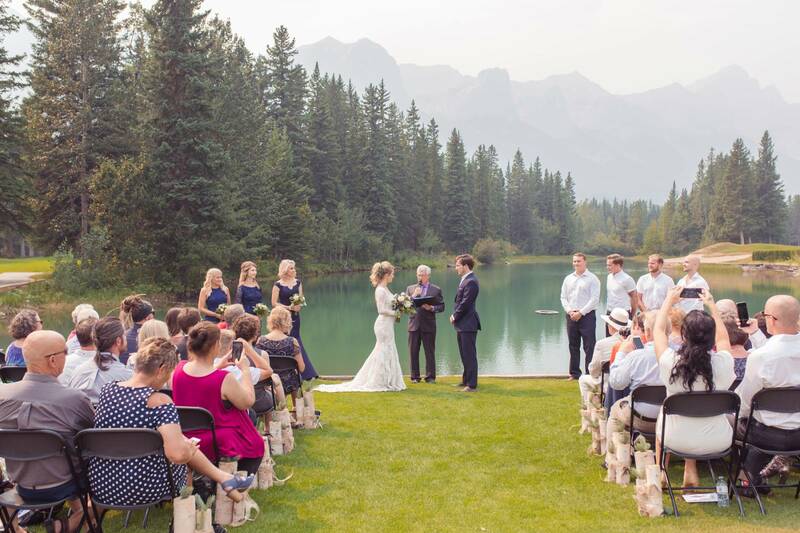 With a glacier-fed pond as the backdrop and amazing views of Rundle, this is a spectacular venue for an outdoor ceremony in Canmore. 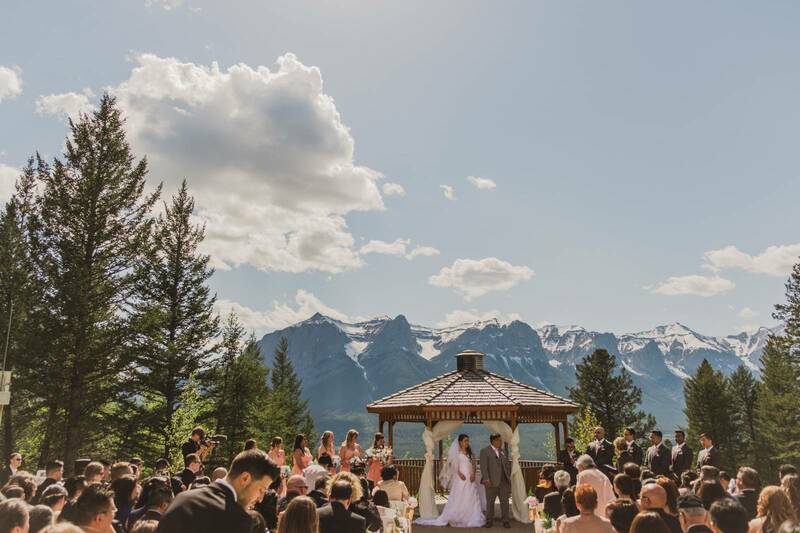 Along with this incredible location for an outdoor wedding ceremony, the Canmore Golf & Curling Club offers an amazing clubhouse, and beautiful three-tiered patios surrounded by wildflowers and natural grasses for your wedding reception. Note: This venue is available for wedding ceremonies with or without a reception. The Silvertip Gazebo feels as if you are on top of the world as you say your vows in front of incredible mountain vistas. Along with this world-class ceremony location and amazing views, Silvertip offers luxurious receptions in their clubhouse with extraordinary food options. Note: Outdoor Gazebo ceremonies are available May through September. A beautiful grassy spot, with the most amazing view of Mt. 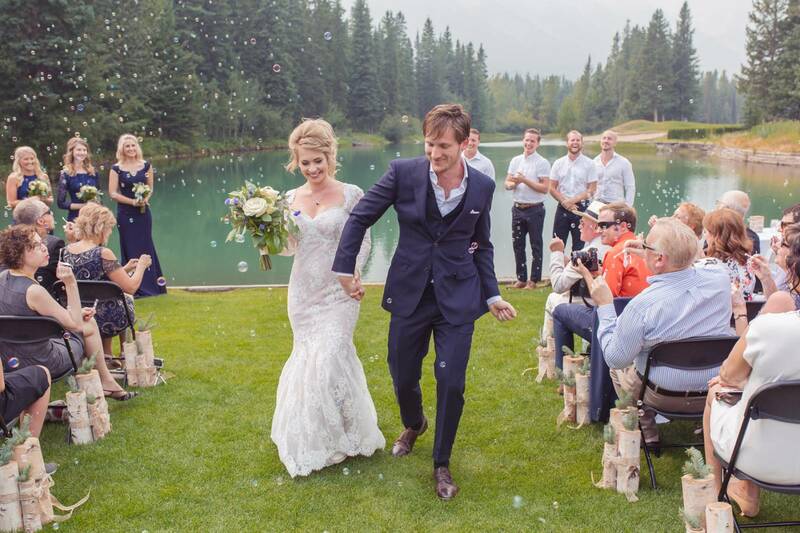 Lawrence Grassi sets the stage for your Canmore wedding ceremony here. Note: Rundleview Parkette is a semi-private venue that can accommodate a wedding up to 80 people and is booked through the town of Canmore (there are no receptions available here). If you want to know more about Mountainscape and how we can help take the stress out of your wedding, be sure to GET IN TOUCH TODAY.